I know this feeling, if only a little bit. Everyday I wake up to see the sun. I am nostalgic for an unremembered past. But the way my mother has gripped my rough, cold hands with her warm, thick fingers made the memories visceral, as if they were my own and not hers. These memories she passed on to me as fables, as rituals, and as a source of heritage. I’m thinking about the city and segregation. What does it mean to belong? My father’s family often regarded my mother and my sisters with suspicion. He was from the South Side; my mother was from the West. They were both born in the South, in Alabama and Mississippi, but neighborhoods and cities have a way of changing you. Chicago in particular changes you. This is said a lot, but Chicago is truly a city of neighborhoods. And it is this configuration of neighborhoods that both welcomes and stifles diversity. You are free to be who you are, so long as you are over there. Lines can and have been drawn both inter- and intra-culturally. My parents settled on the West Side, an area – like the South Side or the North Side – that is complex and complicating. It was important for my parents that we maintained a connection to family in both parts of the city. The older I was, the more it felt like a desire to maintain a connection to the identities of the West Side or the South Side, these black enclaves in the city. We lived in the Austin neighborhood of Chicago, but eventually settled in Oak Park, a suburb of the city that is both wealthy and active. If Chicago is a city that “brushes under the rug,” Oak Park is a city that tries. Often times, it is the effort more than anything else that defines the relations from neighbor to neighbor. Cultural identity is important but it can also be crippling in that what we often define to be “ours” is not right or healthy or meaningful. I’m weary of anyone’s idea of what it means to be black or what it means to be a woman or what it means to be young. Experience tells me that the truth is more nuanced and less familiar. I currently live in the Ukranian Village neighborhood of Chicago. I can&apos;t say whether or not the people who also live here see very many faces like mine. 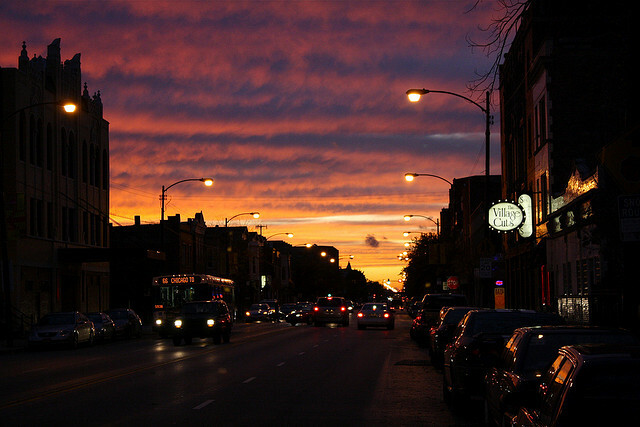 But after years spent living in Lincoln Park and Lakeview during college, I am used to feeling and looking out of place. In late October, I came home from a night out with friends to confront a cab driver who questioned my place of residence. He did not want to know why I lived where I live. He wanted to know how this was possible. "You live here," he asked. I said yes. "This isn&apos;t a black neighborhood," he said. Telling friends of this conversation, they were more upset by the situation than I was. I have been here my entire life. I don’t say this to suggest that this is the truest definition of the city. I say this because identity, like the neighborhoods here, is complex. What I’m talking about is constructed identities, not necessarily our own constructions. I am where I live and where I Iive is who I’ll always be. What I’m talking about are the narratives that were born long before us and will exist long after us. I want to say, this is who I am as a person. But the world says, this is where you’re from and so this is who you are. Stay put. Chicago faces the results of years of suppression and disintegration. I’ve noticed this source of conversation in many local news outlets and I don’t think it is as much a trend so much as it is the tipping point of questions of the future, of what it will mean to be a Chicagoan five or ten or fifteen years from now. Will things be as they are? Like a lot of matters regarding the city, the answers are not cut and dry. For a city like this, I would hope not. Follow Britt on Twitter @britticisms.